We’ve yet to reach the point where someone makes a heartfelt movie about someone training their bladder so they can work in an Amazon warehouse, or one that roots for a sick kid to hit their GoFundMe goal so they can get life-saving surgery because America’s healthcare system is a joke. But we do now have “DriverX,” the equivalent of these daily hustles but for the world of rideshare drivers. 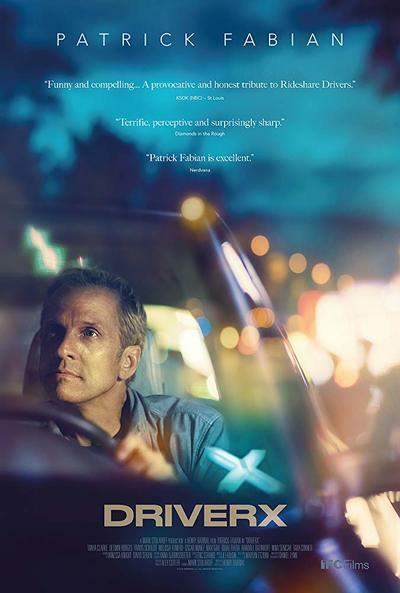 Writer/director Henry Barrial understands that getting in a car with a nonprofessional driver, or driving around people in your family vehicle, is a new normal, but chooses to engage this with the bloodless tale of a mopey middle-aged White man's emotional reinvigoration, thanks to his new job that doesn't allow for tips. “DriverX” is worse than just one of the year’s most vapid movies, it’s an out-and-out nightmare of late-stage capitalism. This is the the story of Leonard (Patrick Fabian), a dad who is trying to find some direction after closing down his record store (named after a Little Feat album) and unable to find much money in selling his vinyl collection. Worse, a job interview at a hip millennial cesspool, where the kids play ping pong and talk about gender identity, has become a dead end. So, he decides to fire both his family’s pool guy and also the landscaping guy, and take up work for DriverX, this movie’s equivalent of Uber. At first he’s bad at it, forgetting to double check his riders’ names, or not having an auxiliary cable at the ready, and he often has to shrug off rude, strange people. But he gets better at working for DriverX. And that’s the plot. You’re uncertain if something is actually going to happen in “DriverX,” if a murder story is going to evolve out of the movie’s true disdain for millennials and women, or, if the movie will take us out of the dull confines of this man’s hustle and stop normalizing all of this to the tune of a feel-good narrative. No dice. The intent of “DriverX” is revealed at the very end of the credits: the story is dedicated to those who “may have unhappily and reluctantly left their old lives behind to join the new on-demand economy.” But that comes off as more an acknowledgment that some people have less sunnier lives than Leonard, a focal character whose biggest personal challenges include the riders who want to test his fidelity, and that he initially doesn't know to double-check customers' names before they get in his car. And while there’s absolutely a discussion to be had about ridesharing culture, this movie does not have it. "DriverX" does not take into account the taxi drivers whose learned skill has now become commodified to anyone with a car and GPS, nor does it take a stance on this new on-demand economy other than documenting it in a narrative film. It’s a profoundly inert concept for a movie that refuses to have an edge, as proven further by its filmmaking. There are plenty of awkward camera movements and late cuts, especially in scenes with Leonard and his wife in their very white kitchen, to suggest that it didn’t have a clear visual concept; the same goes with coverage inside his car, in which seemingly every angle possible is used, without any type of consistency or meaningful visual statement. “DriverX” is better as a small collection of bizarrely-toned moments, like when Leonard goes into his closet after his wife passes out on him before possible rumpus time, and then pulls out what becomes his superhero costume: a bright blue Members Only jacket. Leonard is a dud of a leading man, but his passengers and their brief interactions are equally uninteresting. The script uses them to repeat the same “people are weird!” point or inspire a bit of self-reflection within Leonardo, whether it’s about his marriage with a reoccurring bro or about the time he saw his child being born (an odd choice for a one-take monologue, but that's "DriverX"). The riders are merely recognizable, a sociological bingo card with their apathy, sporadic empathy and/or their drunkenness, and the women are written with special disdain taking selfies, puking. To be fair, the one character who is written with some sense is a briefly-seen older man, who opines that rideshares have figured out the latest way to take money from the middle-class and to the few who are extremely rich. But that’s what this movie is doing: selling a lifestyle of working for billion-dollar rideshare companies, masquerading as a light-hearted indie when it has the soul of a commercial. And what of the film's Kickstarter backers, whose names appear at the end of "DriverX" after a bunch of loving close-up shots specifically hawking the Toyota Prius? They should contact customer service—they’ve been ripped off.